This week, I had an experience that I wasn’t sure I would ever have. I saw a Beatle play live. George Harrison played here in 1974; I couldn’t get tickets. John Lennon played in Toronto, and had his famous bed-in in Montreal, but never came to Vancouver. I missed Paul McCartney’s 1976 show in Seattle when he first toured with Wings; McCartney has played in this area several times since then, but either I wasn’t able to get tickets, or couldn’t afford them. So when I heard that Ringo Starr and his All-Starr Band were going to play at the local casino, I figured this was my chance. And I bought tickets. Different versions of the All-Starr Band have been touring in North America for about a decade. In concert, each of the band’s members takes turns playing the songs they or their former bands are known for. Ringo sings some of his songs and then plays drums while everyone else is performing. I wasn’t quite sure what to expect from a concert with this format, but everyone in the band is an excellent musician – so I even enjoyed the songs that I’m not a big fan of. And they all clearly enjoyed playing as a group and having a good time together. 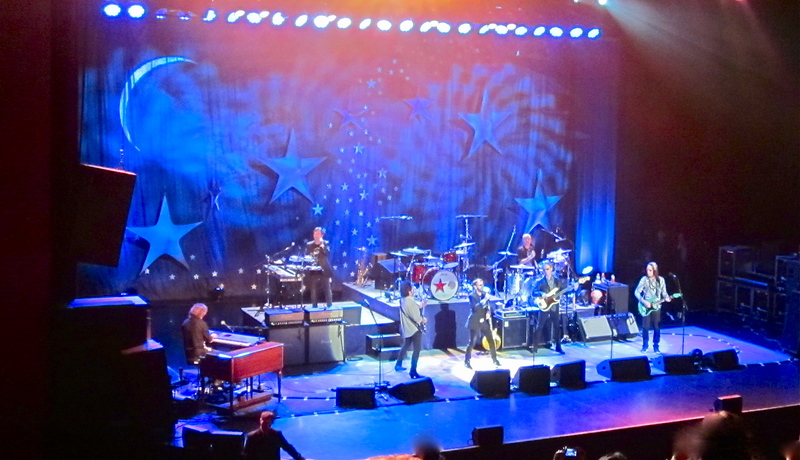 At the end of the show, when Ringo sang “A Little Help from My Friends“, I cried. The week that Sgt. Pepper’s Lonely Hearts Club Band was released, I seriously don’t remember hearing any other music except that album. It was being played in stores, on the radio, at my friends’ houses – it was everywhere, and even then I knew it was an epic creation. And after that week I’ve listened to the album thousands of times. I can’t really put into words what it was like to hear Ringo sing that song live, other than it felt like everything since 1967 connecting in one timeless joyful whole. It was overwhelming and deeply emotional. I feel very, very lucky that, at last, I got to see a Beatle. It took a long time to happen, but it was a great experience. If you like the Beatles’ music you have to see Love at the Mirage in Las Vegas. George Martin produced it. I was amazed at how these 50 year old songs worked in a modern setting. I was too young when the Beatles albums were originally released but I remember my first LP, a gift, was Let it Be. And I was hooked for life. I actually started to learn English by translating Beatles songs (which created some confusion that persisted for years: I wasn’t sure for the longest time what a walrus was and, because in Italian we say “sleeping like a mole”, I thought a log was a mole…). Sat next to Ringo and his wife Barbara (and sofagirl) in a movie theatre in London once. Closest I got to a Beatle.. He was always my mother’s favorite Beatle.